Sanibel and Captiva Islands on Florida’s Gulf coast is a popular tourist destination for the serious seashell collector. It is possible to find some quite rare shells there, and it’s impossible to not find any. Some of the beaches on Sanibel Island are nothing but shells! But if you travel to Florida’s east coast – which is very long – you’ll still find your share of seashells. Just don’t expect them to be as plentiful. You will probably also see some very interesting sea life, dead and alive along the shore. One of the best times to get out looking for specimens on the beach is when few other people are doing so. I always loved to stay at the beach and go out walking after supper when the atmosphere was more relaxed and the burning sun was no longer an issue. We have found seagrass, driftwood, bits of coral, crab claws, seaweed, jellyfish, egg cases (that is one from a lightning whelk in the picture, but it was found on Sanibel), crab shells, horseshoe crabs and more while strolling the quiet beach. We used to see things that actually looked pretty gross and we had no idea what they were. As far as seashells, most often we would find clam shell or cockle shell halves, but occasionally we’d get a piece of a sand dollar. You can also find jingle shells and kitten paw oysters, jackknife clams and pen shells. In fact most of the shells in the pictures along my blog sidebar (to the right) were found along the east coast. (Some of my larger shells and the sand dollars were purchased.) We used to find some very big pen shells as I recall. My kids used to play with the little mole crabs (or sand fleas) and try to catch one to keep in their bucket for a while. And of course the tiny and colorful coquina shells are plentiful, but usually occupied. I didn’t know anything about seashells back then, so who knows what we threw back and didn’t keep, but we usually kept the pretty ones that were in one piece. We also kept pieces that obviously broke off something much larger and could only dream of what the seashell once looked like. If you visit Florida’s east coast, keep your eyes peeled for interesting wildlife and seashells. Just remember not to take home anything living! I wanted names of places to look on the east side for shells and got nothing. Everyone knows about about Sanibel and it’s not on the east side! The East side of the state of Florida has a lot fewer shells than the west / Gulf area where Sanibel is located. There are beaches up and down the entire East side – too many to name. Look on a map and visit the area. I don’t believe any one beach is better than another on the East when it comes to searching for shells. Begin with New Smyrna Beach, Vero Beach, and Daytona Beach. There are many more depending on where you want to go. Thoroughly enjoyed this entry! While it is a world away from my wanderings in the deep snow and cold of semi-rural south central Alaska I’ve been to many Florida beaches – mainly in the Sarasota-Bradenton area – and shell collecting is always a major part of such visits along with snorkeling, SCUBA and just enjoying the conditions. The West coast is the place to find the great shells. I have to do more searching over here on the East coast. It’s all fun though! Thank you for stopping by. Whelk Egg Case. I find them in Galveston all of the time. How nice, I never see them. Sorry, I don’t know what that is. Is it coral maybe? My question was best beaches for shelling on Florida’s east coast. Got an answer for the west coast, which doesn’t help me!!!!! I can’t advise on the best east coast beaches, I only know a few. New Smyrna Beach and Bethune are the two I visited most. This post only shares what I’ve found along that area, and isn’t meant to point you to the best shelling beaches on the east – because I don’t know! To the best of my knowledge they are all about the same on the east. 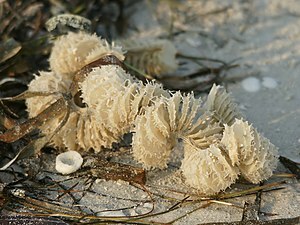 More searching has to take place to find decent specimens than does on the Gulf Coast beaches where shells are numerous and plentiful. The beaches from Jupiter south are more likely to have little pieces of coral etc. washing in. One time when we got lucky there were plenty of shells north of Blowing Rocks Beach in Jupiter. I want to go to Blowing Rocks Beach. It’s on my “to do” list. Beachcombing is never boring. I was looking for some beach names. Could you give me a few so I can check them out? Florida beach names usually correspond to the town they are in. Such as Daytona Beach, Flagler Beach, New Smyrna Beach – on the east coast. I suggest you look at an online map and decide which areas of the state you might be interested in as there are MANY beaches all along the Florida coastline, in the Keys and related islands, such as Sanibel.